Lack of awareness of the dangers from ammonium nitrate despite published guidelines and earlier similar historical tragedies caused the tragedies at the port of Texas City on Galveston Bay. 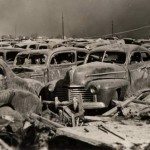 Two explosions of ammonium nitrate fertilizer shattered Texas City and its surrounding area beginning on the morning of April 16, 1947. In the first explosion the freighter Grandcamp’s explosion was heard 150 miles away. The second one, High Flier, was no less fierce when it blew up sixteen hours later. Several thousands were injured and 568 killed. It caused the greatest number of casualties of any U.S. industrial accident. Texas City on Galveston Bay, about thirty miles southeast of Houston, Texas, was a thriving oil port in the 1930s with a population of six thousand. Several oil refineries stood near the docks and the shipping traffic was mainly occupied with crude oil and petrochemical products. With the onset of war in the first half of the 1940s and a rising demand for aviation fuel and a range of synthetic chemicals both the population of the city and the growth of industrial capacity expanded dramatically. Production of oil based products jumped fivefold in five years and the population more than doubled. By 1947 there was an aura of success and confidence as business continued to grow in the aftermath of the war. A zoning law was passed in 1946 to establish which areas were to be devoted to industrial, residential, and institutional activities and in each of these places safety precautions were given high priority. Gas and oil storage tanks were both equipped with fire control systems and surrounded by dikes that would prevent spills reaching other buildings if accidents occurred. There were good reasons for these precautions. Within a one square mile area next to the docks there were six oil-company complexes, eleven warehouses, plus several other installations and residential blocks. Experts in fire prevention assured the port authorities that only one-fifth of this area was in danger of a serious fire and existing precautions would be adequate to cope with such an eventuality. All of this thinking should have changed when large quantities of ammonium nitrate fertilizer began to be shipped from Texas City in 1946. Now, in the event of an accident, there was the possibility of a conflagration that would affect the whole dock area, not just one-fifth of it. Two conditions prevented the kind of new thinking that was required. The port authorities responsible for handling the nitrate—the railways and the masters of ships—operated independently of the other agencies and they saw no reason for coordinating their safety systems with those already in place. In their minds these shipments were no different from the cotton and the other bulk commodities they handled. The second dangerous condition was general ignorance of the lethal potential of ammonium nitrate. The fact that the nitrate had come from an army ordnance factory should have raised questions about safety, especially since a 1941 army manual listed ammonium nitrate as high explosive. It had in fact half the explosive power of TNT. In addition, a 1945 U.S. Department of Agriculture publication on the same subject said that it would explode if given a strong impulse or is held in a restricted space under conditions of rising heat and pressure. There were other conditions listed in different publications— such as the effect of fire—that added to the lethal potential of ammonium nitrate, some of them directly related to the tragedy that occurred at Texas City. In Germany, twenty-six years earlier, as will be described later to illustrate the seriousness of neglecting the lessons of past disasters, a gigantic explosion occurred in a storage unit containing this same substance, ammonium nitrate, yet ignorance of it was as common as the unfamiliarity with the U.S. Army publication. Prior to April 16, 1947 almost a hundred thousand tons of ammonium nitrate had passed through the port at Texas City for onward shipment to other countries. There had been no incidents in this time and so the assumption that it was not an explosive substance was reinforced. The nitrate was manufactured in ordnance plants where formerly it formed part of the ingredients for bombs. Small quantities of clay were added to each shipment to prevent caking, a problem that led to the disaster in Germany. Ammonium nitrate had the double advantage of being relatively inexpensive as ell as being richer in nitrogen than some other fertilizers. Following the end of World War II principal destinations for the fertilizer lay in Europe where the United States sought to expand food production and speed up recovery from the war. The freighter Grandcamp was to take its cargo to France. More than 2,000 tons of ammonium nitrate had already been loaded on to the Grandcamp when a small fire was found in the hold, possibly due to a smoking cigarette stub. Smoking, while officially prohibited on the docks, was generally permitted at that time. Longshoremen who were working in the hold tried to put the fire out with fire extinguishers but failed. At that point the captain intervened. He felt that the use of water would damage other things in his cargo so, instead of dealing with the problem, he closed the hatches and ventilators and turned on the steam system in an attempt to smother the fire. It was the kind of move that almost certainly guaranteed an explosion. In addition, as a precautionary measure, he had cases of ammunition removed from a nearby hold. As the fire grew, the heat forced both longshoremen and crew to leave the ship. The ship’s alarm was then switched on and contact established with the fire department onshore. Before any help could arrive, hatch covers were blown off by the pressure buildup, smoke and flames shot upward, and moments later the entire ship blew up in one gigantic explosion. The shock wave alone, quite apart from the cluster of steel that accompanied it, did enormous damage. Two planes flying overhead were brought down. The intensity of the fire at this stage ensured that everyone still on board the ship or near it was vaporized. Flying objects killed hundreds in the immediate vicinity of the pier and lighter debris damaged buildings in the business district, a mile away. Some of the flying pieces from the Grandcamp weighted several tons. A fifteen-foot wave, a sort of tsunami swept up from the harbor by the explosion, picked up a large steel barge and carried it onshore. There were quantities of cotton and other textiles in the ship’s cargo and these now became fireballs raining down on shore, triggering fires everywhere. At Galveston, ten miles south of Texas City, people were thrown to the pavement by the force of the blast, and at some locations twice as far away buildings swayed. People rushed to the docks at Texas City to search for relatives and friends. Wounded ones were everywhere, covered in black oil, stunned into passivity by their ordeal. The city auditorium was transformed into a first-aid center to cope with the thousands of casualties. Doctors, nurses, and ambulances were brought in from neighboring communities. Law enforcement officers also had to be called into service from other places to help establish some sort of order. But just as things began to come together there was a second cataclysm. Because of the general indifference to the dangers of ammonium nitrate, no one took much notice of the second freighter that also was being loaded with the same dangerous cargo and was now carrying a thousand tons of it. The High Flier had been torn away from its moorings by the force of Grandcamp’sexplosion and was stuck alongside other vessels. It had been severely damaged and before long the thick black fumes from the first explosion forced everyone to leave it and head for shore. Rescuers looking for survivors checked the High Flier in the course of their search and noticed a fire in one of the holds but there was so much anxiety over the first explosion that little thought was given to this. Not until late on the evening of the sixteenth was any action taken to deal with the High Flier. At that time flames were shooting high into the air. Before anything could be done, either to move the ship out to sea or douse the fire, it blew up in a second blast just like the first one. Casualties were much lighter this time, not because the explosion was less powerful but rather because there had been a general evacuation from the port area. Additional damage was now done to buildings that were already partly destroyed with the first blast, additional oil tanks caught fire, and a shower of large pieces of steel, just as had happened in the earlier blast, caught everyone who still happened to be near the piers. It took a lot of time to get federal and local authorities into action to ensure that a tragedy of this kind would never recur. Culpability was not acknowledged by anyone yet errors due to neglect were everywhere. The whole infrastructure of the port area was wrong. Large oil tanks and other highly inflammable products were stored close to the piers without regard to the conflagration that would erupt in the event that a ship caught fire. No procedures were in place to deal with emergencies. The disaster brought changes in some of the processes involved in chemical manufacturing and there were new regulations for the bagging, handling, and shipping of chemicals. Thousands of lawsuits were finally settled in 1956 with a total cost of more than sixteen million dollars. The bodies of the sixty-three unidentified dead were buried together in a memorial cemetery. A park beside this cemetery was dedicated to them forty years later. Had there not been neglect of previous accidents with ammonium nitrate, together with indifference among the authorities at the Galveston Bay to warnings regarding the handling of this product, the whole tragedy of April 16, 1947, could have been prevented. Twenty-six years earlier, in the morning of September 21, 1921, in Oppau, Germany, a massive ammonium nitrate explosion occurred at a chemical plant. The factory that processed the chemical and the village of Oppau were totally destroyed. Casualties were many. The cause of the accident was ignorance about the explosive potential of ammonium nitrate. The Badische Anilin Company built a factory in Oppau in 1911 to produce, among other chemical products, agricultural fertilizers. Oppau was a small community of about 6,500 people not far from Mannheim. A new process had just been developed by German chemical engineers to produce these fertilizers from ammonium sulfate. The traditional natural supply from organic waste was in short supply so this was a timely substitute for Germany’s agricultural industry. The country was prosperous with an expanding economy and needed a stronger agricultural base. Since farmers use fertilizers almost entirely in spring the factory had to stockpile large quantities through the year in preparation for sales at the beginning of the following year. A large number of sixty-foot silos were built to store the ammonium sulfate. These were still in place ten years later as Germany tried to cope with the four-year devastation of World War I from 1914 to 1918. The country was impoverished with its currency so low in value that little could be purchased beyond its own borders. Raw sulfur could not be purchased from abroad so the factory shifted its fertilizer production to ammonium nitrate, an acceptable substitute. The new chemical was stored in the same sixty-foot silos that had been in use previously. Because there was no great outcry regarding the dangers associated with the new chemical, the same procedures that were in place for handling ammonium sulfate remained unchanged. There was, in fact, a widespread assumption that ammonium nitrate was non-explosive. To some extent this was true. Ammonium nitrate requires high pressure or very high temperatures before this chemical will cause an explosion. In the Oklahoma City bombing of 1995, Timothy McVeigh needed starter explosions in order to make the ammonium nitrate explode. Ammonium nitrate has a particular quality that workers in Oppau did not have to contend with before, namely its tendency to attract moisture from the atmosphere and become sticky. In the course of a year this can compress into a solid mass almost like concrete. In the context of sixtyfoot- high silos additional pressure was applied to the nitrate. After many failed attempts to loosen the ammonium nitrate with picks and shovels the Oppau workers decided to use low-grade dynamite. They bored holes, set the dynamite, and blasted some of the very hard material into smaller pieces. This level of explosives was quite permissible for breaking up solid substances. It was a risky business and it would never have been employed if workers knew the properties of the new substance they were now handling. For a short time it worked and nothing went wrong. On the morning of September 21, the method failed. Instead of the previous effects there was one large blast, followed a short time later, as other containers were heated and ignited, by a gigantic explosion. A column of fire shot upward into the air for a thousand feet and everywhere around there was total destruction. An eight-foot-deep hole, a third of a mile in diameter, was carved out beneath the factory. Much of the depression formed at that time can still be seen today. The entire town of Oppau disappeared. The blast was so strong that it shattered windows forty miles away. More than five hundred people were killed and 1,500 additional people injured. Workers lived in three and four story apartments within walking distance of the factory so they and their families had no chance of avoiding the blast. Like many industrial communities of that time, a hard lesson was learned, namely that residential buildings must never be built close to factories. In many developing countries today this rule is ignored because it is cheaper to live close to work. In the Bhopal tragedy in India in 1984, thousands might have been saved had thus rule been followed. In spite of a local law that forbade it, workers persisted in living close to the factory. In Oppau, the explosion was made worse by an absence of any medical facilities. The community had neither a hospital nor doctors so all the injured had to be taken to Mannheim. Because of the widespread damage and large numbers of casualties there were numerous delays. The roofs of buildings in Oppau were made of heavy clay tiles that lay on support beams that were not fixed to anything. As a result, these tiles became flying missiles, adding to the horrors of the time. A great deal of suspicion accompanied the explosion and it took a long time for newspapers to get accurate information. For one thing, it was well known that the factory had been a producer of munitions and people thought that the explosion was the result of experiments with new explosives. It was also known that just before World War I this place had been manufacturing the poison gas that was used in the course of the war. This unsavory reputation may have isolated the community and hindered them from knowing more about the dangers of ammonium nitrate.